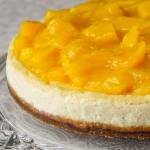 Creamy Gingersnap Mango Flan - oh so easy to prepare. Creamy Gingersnap Mango Flan. The flavour of ginger and mango go naturally well together, in this easy to prepare dessert that impresses without a lot of effort. Here’s a stunning and very easy-to-make dessert that is perfect for dinner parties or just a family Sunday dinner. The flan itself has only a few simple ingredients. The pairing of a gingersnap cookie crumb base with bright fresh mango is utterly delicious. Like peaches, mango and ginger is just a magical flavour combination. We make this sour cream flan in may combinations of flavours. One of our all time favourites uses our bountiful Newfoundland blueberries. That version we have made literally hundreds of times in our household. Find it here. 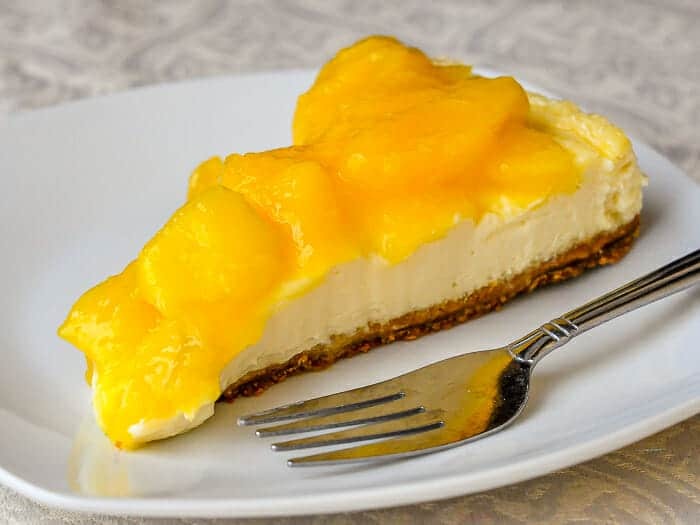 The sour cream may seem like an unusual ingredient in a flan but it is quite an unusually delicious and refreshing change from a heavier cheesecake for example. 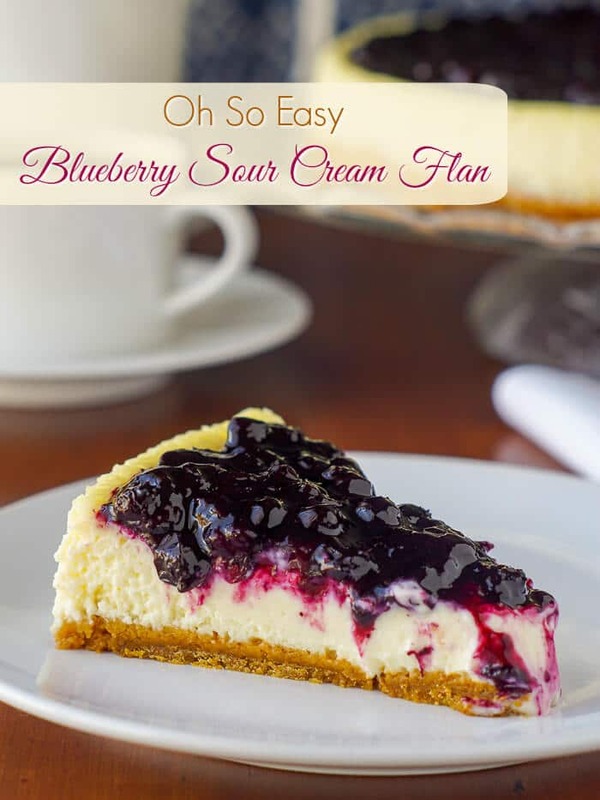 The slight tang of the sour cream blends well with the vanilla in the flan and the natural fruit flavour too. This is one of those simple desserts that your guests will think you slaved over. We won’t tell them the difference if you don’t! 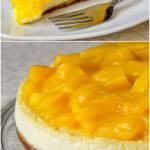 Like this Mango Flan recipe? Creamy Gingersnap Mango Flan. The flavour of ginger and mango go naturally well together in this easy to prepare dessert that impresses without a lot of effort. Simmer half the mangoes with the sugar over low heat until the mango is softened and beginning to fall apart. Add the other half of the diced mango and simmer only for an additional few minutes. This method will ensure a good chunky consistency to your finished compote. Cool completely. Grease the bottom of a 9 inch spring form pan, lining the bottom with parchment paper to make the flan easier to remove from the pan when baked and cooled. Mix together the cookie crumbs, butter and sugar until well combined. Press into the bottom of the prepared spring form pan. Whisk together the sour cream, sugar eggs and vanilla extract until the sugar is completely dissolved. Allow the flan to cool to room temperature in the pan then refrigerate for several hours, still in the pan. 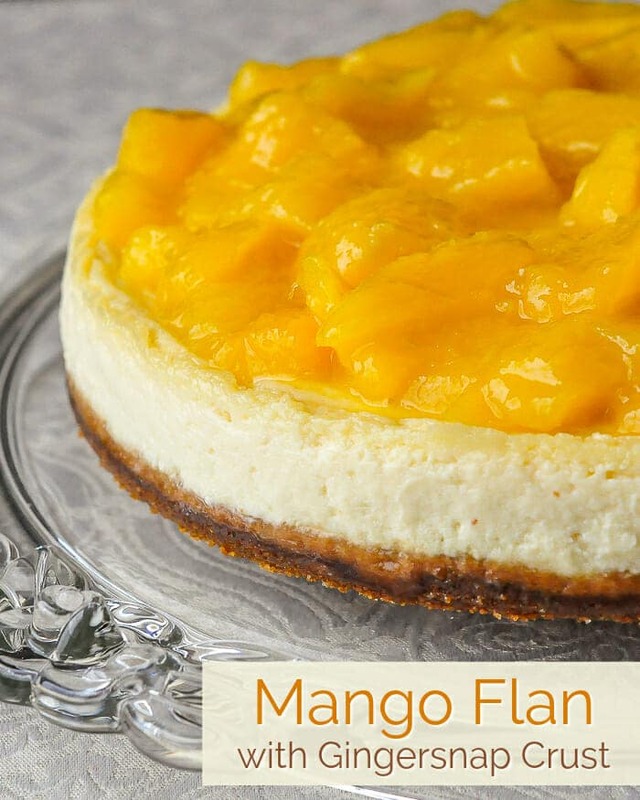 Remove the flan from the pan to a large flat serving plate before topping with the mango compote and serving. Previous Post: « Brownie Cheesecake – a luscious marriage of vanilla and fudge! Hummmm… très difficile lui résister, il est superbe, bravo! How do you think this would work using greek yogurt in place of the sour cream? I love the recipes, but would like to cut some of the calories from the sour cream. By the way, I made your Roasted Tomato Fennel Soup and it was fabulous….gonna make it again!!! It’s the fat content that allows a baked custard to set. Substitutions will not work. This was worth every last calorie. We love mangoes & are always looking for new ways to use them. This is perfect! i am going to try it as our Easter dessert. Would this work with 14% MF lactose free sour cream? I’d certainly give it a try but I’ve never used it myself.